Following 18 months of development in collaboration with some of the most prominent global tech giants, Innovant is proud to launch its FORm_AV Video Conferencing Suite. Video conferencing is rapidly expanding in the workplace, demanding more sophisticated, yet flexible solutions to accommodate this technology. Innovant offers an especially apt solution that eliminates the high construction costs of technology mounting and cable routing through floors and walls. With all cabling housed directly within the technology stand and accompanying conference tables, FORm_AV provides superior utility with zero disruption of the physical environment. FORm_AV stands are also uniquely engineered to deliver high-capacity display support for either single or dual monitors (up to 80” wide). When configured with Innovant’s FORm_AV conference tables, the product creates a fully integrated conference AV platform that provides unparalleled flexibility and speed of assembly or relocation for the fast-changing conference environment. FORm_AV conference tables (available in a variety of shapes and sizes) offer intelligent power & connectivity management and access for technology-intensive clients with special requirements. Desktop power, USB, laptop charging cords, and other connectivity options are all available through easy access panels in the tabletop. Standard desktop finishes include high pressure laminate and wood veneer with Innovant’s proprietary Greenlock™ finish (tailored materials available upon request). Innovant’s FORm_AV Conferencing Suite epitomizes efficiency, balancing a minimalist aesthetic with the super strength of its function. Now available to customers, the product will be formally unveiled at Neocon 2014 in Chicago. 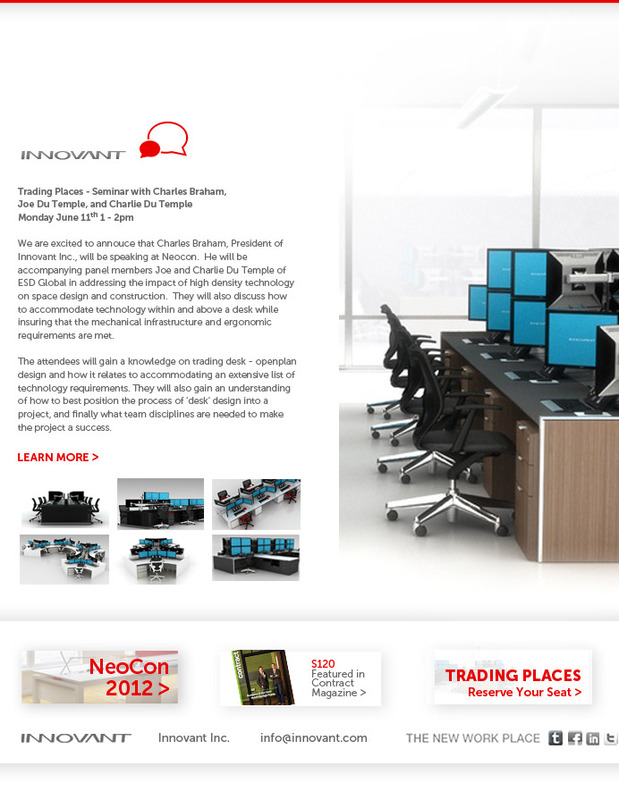 For more information about Innovant, FORm_AV or any other conference products, please visit http://www.innovant.com. Earlier this summer, the marketing team attended an IIDANY Facilities Forum focused on the topic, “The Evolving Workplace: Change or Adapt?” Moderated by David Craig, Associate Principal at Cannon Design, the discussion featured insights on the evolving workplace and what this means for our industry from two workplace innovators, Greg Lindsay, Contributing Writer for Fast Company, and Bart Higgins, Director at ?What If!. Greg agreed to elaborate on some of his ideas for our blog, including explorations into what he calls “the blurring of the office and the city.” Read “Part One” of our interview here. DH: Do you think your amazement that Google is investing so much money in physical space relates to the idea of “engineering serendipity” that you’ve promoted? Are they really able to think in those terms when they’re moving so quickly? GL: Everything I’ve said so far is a mix of anecdotes and hypotheses. The real question is whether we can test any of this — what new styles of work, collaboration, and organization are emerging in cities? What kind of environments will be disrupted by these shifts? What solo- vs. group work patterns exist, how are they evolving, and how can they be mapped, understood and enhanced? How can new ways of organizing work in cities make people more creative, productive and happy? And what are the benefits of doing so— better retention rates? Higher productivity? Greater innovation? And how do we measure any of this? Earlier this summer, the marketing team attended an IIDANY Facilities Forum focused on the topic, “The Evolving Workplace: Change or Adapt?” Moderated by David Craig, Associate Principal at Cannon Design, the discussion featured insights on the evolving workplace and what this means for our industry from two workplace innovators, Greg Lindsay, Contributing Writer for Fast Company, and Bart Higgins, Director at ?What If! . We were particularly excited to hear from Greg as we had posted his New York Times article, “Engineering Serendipity,” on our blog. This post summarized Greg’s commentary on workplace policies by the likes of Yahoo! and Google, describing how a company can boost employee creativity and productivity by engineering social interactions. Greg agreed to elaborate on some of his ideas for our blog, including explorations into what he calls “the blurring of the office and the city.” Read on for his insights into 21st century ways of work and places for work. Please check back for “Part Two” of this interview, which will be posted next week. The first week of August marks “Simplify Your Life Week,” a time for us to reevaluate our lifestyles, habits, and environments in order to rid ourselves of clutter. Doing away with needless items and time-consuming busywork frees up both physical and mental space for the things that are most important. This kind of prioritizing is vital in the workplace, where minutiae can pile up faster than we can get rid of it unless we take the initiative to organize (read: simplify) our lives. Cable Management: Innovant’s sophisticated cable management system not only hides unsightly, spaghetti-like cables from view, it also provides practical elements for organizing visible cabling. Combinations of grommets, brush strips, and center well cable drops offer users multiple options for cleanly running tabletop cables to hidden power supplies. Desktop power options even allow users to plug in transient items like cell phones and tablets without disrupting permanent cabling for workstation items. This management system allows workstations to maintain an orderly appearance, while also preventing any accidental trips over cords that could endanger workers or accidentally power down critical systems. Storage: Our clients often seek storage options that don’t occupy too much real estate. Innovant’s storage pedestals fit neatly below workstations for seamless storage integration. Whether static or mobile, these modular storage units provide flexibility that can account for future growth. Worktop storage cubes, which do not require tools for installation or removal, can be easily placed anywhere along a work surface. This provides end-users with dedicated places to store critical items and papers for easy access. Other below-work surface items like bookcases or trash receptacles offer versatile storage solutions to keep workstations free of clutter. Technology Integration: Innovant desks make it easier than any other brand of furniture for clients to make hardware and cabling changes. IT staff can deftly access the raceway from above through either flip-up panels or slide-out worktops. This means staff can make major technology adjustments without ever having to get their knees dirty. Additionally, the generous size of our raceway provides maximum flexibility for mounting and arranging devices. This ensures that there is no mess within the frame, rendering neat and effective IT planning permanently viable. Center Well Accessories: Placing accessories in the center well also helps keep workstations neat and orderly. These accessories eliminate the need for workers to bring their own gadgets, which disrupts workplace uniformity. Options include center well task lights that come in a variety of forms and finishes, all of which integrate seamlessly into the raceway. We also offer several power units, including a flush-mounted unit that can pop open for use or snap closed when not in use. Finally, though the pencil tray infill is a simple item, it provides users a place to corral pens, pencils, markers, etc., all of which tend to be the most likely culprits of desktop clutter. By incorporating such features into our products, Innovant has successfully tailored its workstations for countless clients, which helps ensure employee productivity.